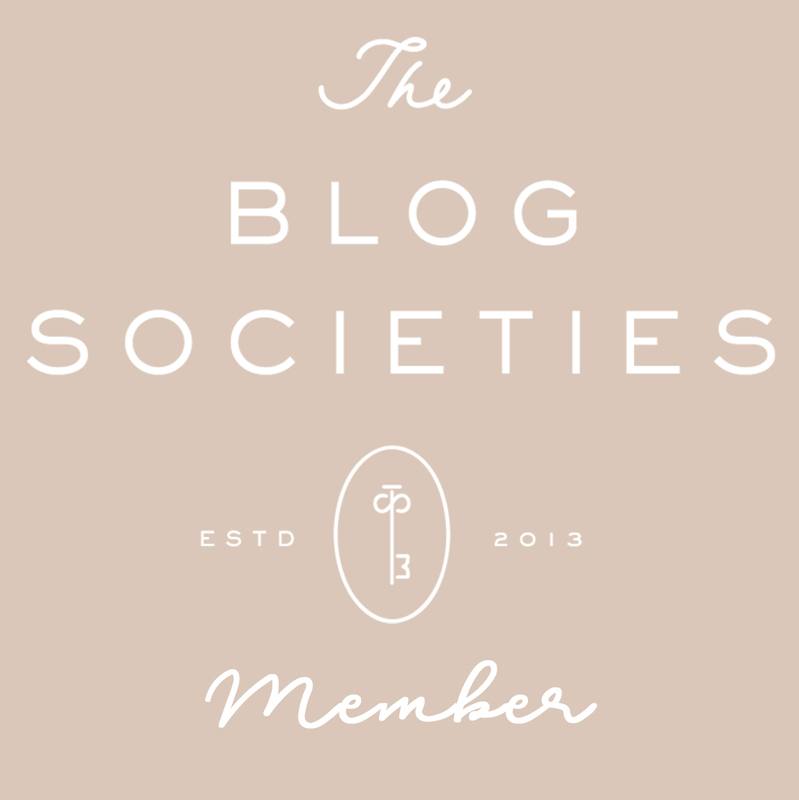 I have mentioned frequently on the blog that I am an introvert and to be honest, it shouldn't come as much of a surprise considering that a majority of bloggers (or at least the ones I follow) are moderate to severe Introverts; that is why blogging is such a HUGE part of who we are. 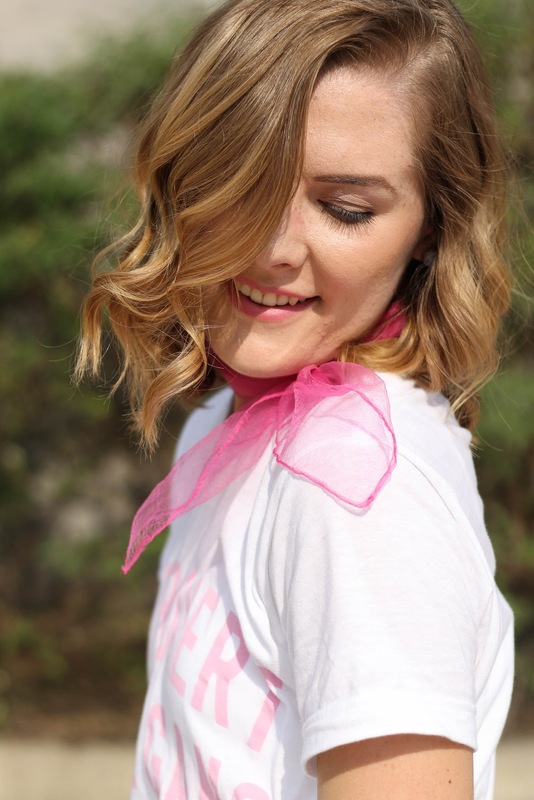 With that being said, while I have mentioned my personality many times on the blog I haven't ever really talked about what it means to live as an Introvert, especially in relation to Introversion and college. Whenever I think about the fact that I am in college, my Junior year no less, I can't help but always get this feeling that I have done the impossible! I don't know why I always feel that way, but maybe it is due to the fact that being in college is such a HUGE STRETCH for me? Granted, most days I am completely fine, but when I realize that I live away from home (on my own), am surrounded by hundreds of strangers, daily am in situations of "people overload," and now with my job, most days I must talk to people I don't know, it always seems like I am living a life that I never knew I would be able to. Crazy thing is, I never realized that I was an introvert until maybe my Junior year of high school. I always just thought I was a quiet and shy person (which is true) but I didn't know that there were actually specific personality types that went along with these traits! Therefore, when I finally realized this I took a test and found that I was an INFJ (the 1%) which means I am 85% Introverted, 69% Intuitive, 69% feeling, 93% judging, and 81% assertive. Realizing that there are different types of personalities, and especially different levels of Introversion definitely helped me understand myself more and how my mind works. College has been a complete game changer for me and has done some crazy things to me as an Introvert. Two semesters ago I applied to be a Resident Advisor (RA) up at college. The crazy thing about my applying to be an RA, was that the job entailed me to basically be an extrovert with my resident, or at least when carrying out my duties. I knew that when I applied, and I truly believe it was the idea of a challenge that inspired me to go through with the crazy plan. Even more astonishing was that I received the job just a few weeks later and was asked to start immediately instead of waiting till the next semester (which meant no formal training). Talk about jumping in HEAD FIRST! Being an RA has completely changed my life....in my job position there are many times where I can become very extroverted, especially now that I am closer with all of my my co-workers. Its crazy to see all of the people that I have met and grown closer to all because I took a leap of faith on a challenge and did something CRAZY! The funny thing is that as an RA, most days I will be walking across campus, or to class and see people I know and actually say "hi" to them because I KNOW PEOPLE NOW at college (did you hear that mom!). Some days I love the idea of meeting new people and talking to them, and then other days I go to BIG college Bible study parties and think...."Man, I am such an Introvert who is WAY out of her comfort zone!" But you know what, that is Ok! It is Ok to have days where I am out of my comfort zone because life isn't perfect and its often all about pushing ourselves beyond our boundaries to achieve something GREATER, and even in those weird situations, I always leave learning something (in the instance above I learned that college guys are absolutely CRAZY and completely immature.....but at least I will live longer with all of the laughing). However, even when I am out of my comfort zone and need to recharge, there is freedom in taking time for myself (or an entire weekend) in watching Netflix, reading a good book, single Goodwill shopping dates, Target runs, and lots of coffee to refuel my Introvert levels. College life as an Introvert is a struggle at times, but it is a struggle and journey that has taught me sooooooooo much about myself. It has taught me that challenges are good things and that they help me grow. It has taught me that when I put myself out there to do something that is sooooo "not me" I will actually be more successful than I think. It has taught me that I actually CAN meet new people and make more than 1 friend in college and go to lunch with them, go to Bible studies with them, talk and just hang out. Sure, I still need days for myself, and I might avoid grabbing lunch at the dinning hall sometimes because #people, but I have grown to love the opportunities I have had to grow. I never would have been able to fathom all that has happened to me in college, much less everything I have been able to accomplish as an Introvert, but it has been totally worth it! 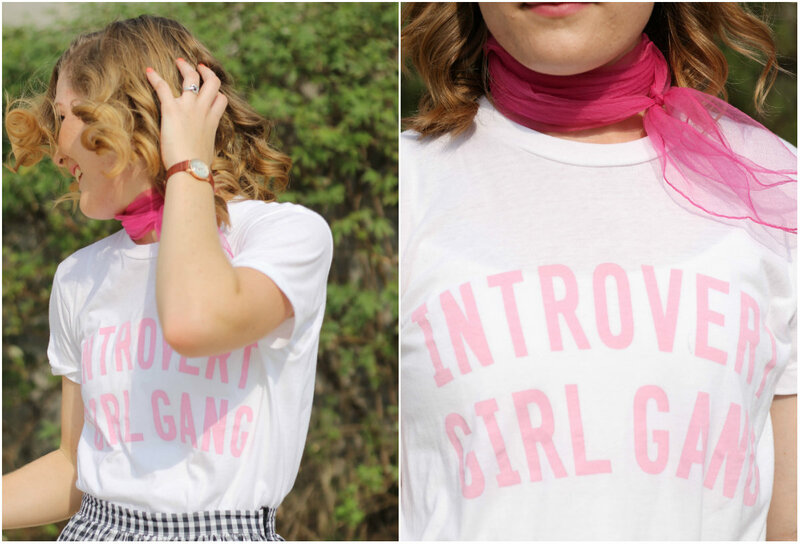 With all that being said and with the times I am challenged to be extroverted, I am still 100% an Introvert, through and through, and proudly wear my Introvert Girl Gang shirt because we have to stick together! As an Introvert (if that is you) you are unique. People might not always understand who you are (ok, most always) or realize that you need time to recharge and reasses life, but always remember that you really can do things that you never thought you would! Sometimes you just have to take a deep breath and jump into a challenge! Challenges are good for us, and if you take them every once in awhile you will grow and learn more about yourself and your abilities. Maybe that is one reason that style means so much to me? 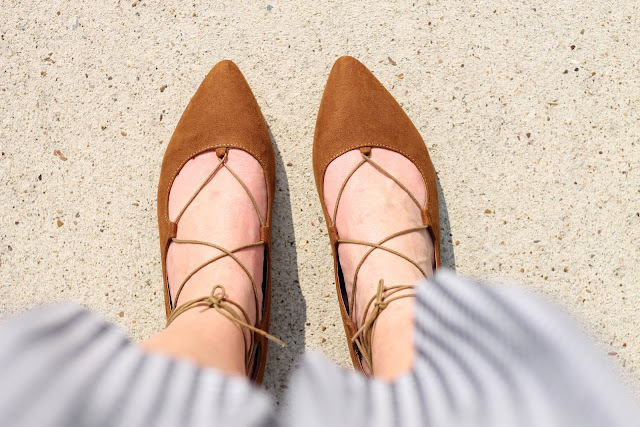 As a reserved and introverted person I tend to say that clothes sometimes talk for me (you wouldn't believe what comments I have gotten from people) and also boost my confidence so much (check out Jessica Boyer's Latest Post on outfit confidence)!! 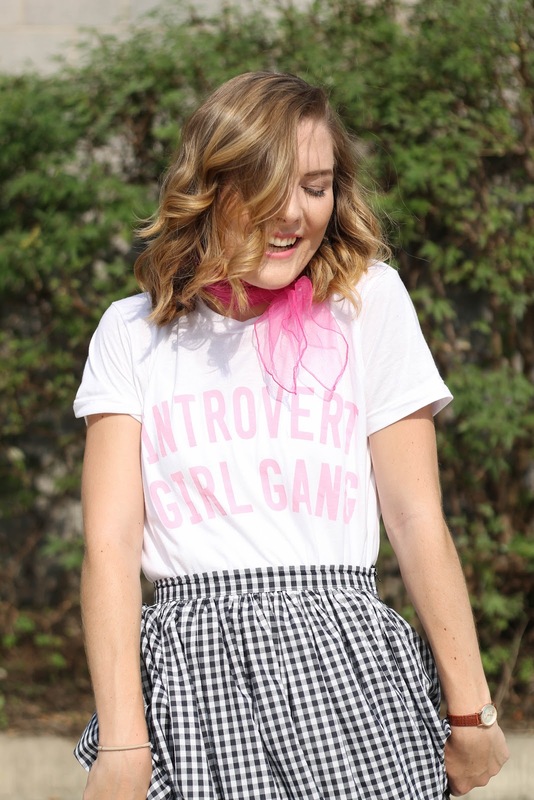 Specifically this ensemble, because it says soooooo much about who I am: classic, with a little sass, a pop of pink, and a LOT of coffee....PLUS you can't forget about the all to IMPORTANT "Introvert Girl Gang" tee which sums up who I am and gives me LIFE! I actually wore a similar combination of this look for my first day of class and I love that in wearing it I let everyone know "whats up"............I'm an introvert and I'm going to EMBRACE it! Any of you Introverts stretch yourself in school? 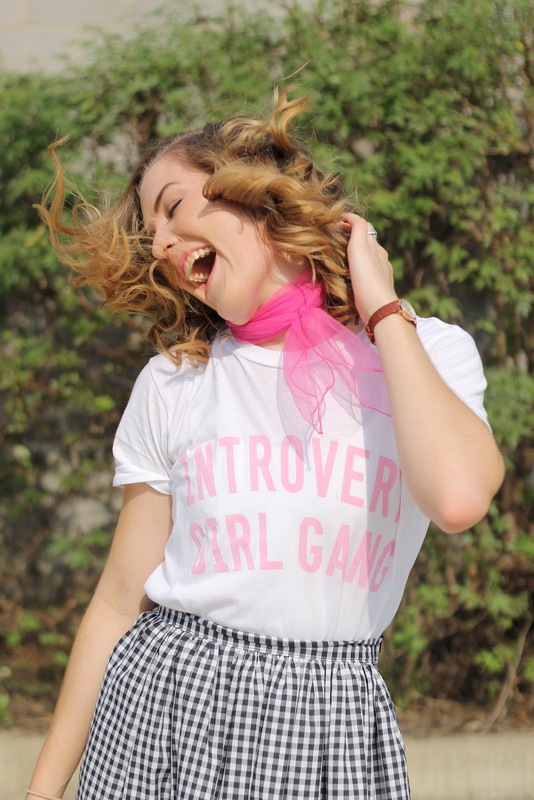 Are you part of the "Introvert Girl Gang"? For a fellow introvert, this was a very inspiring post to read. I've been seeking to try new things lately, and although some ideas can scare me sometimes, it's encouraging to hear "your story". 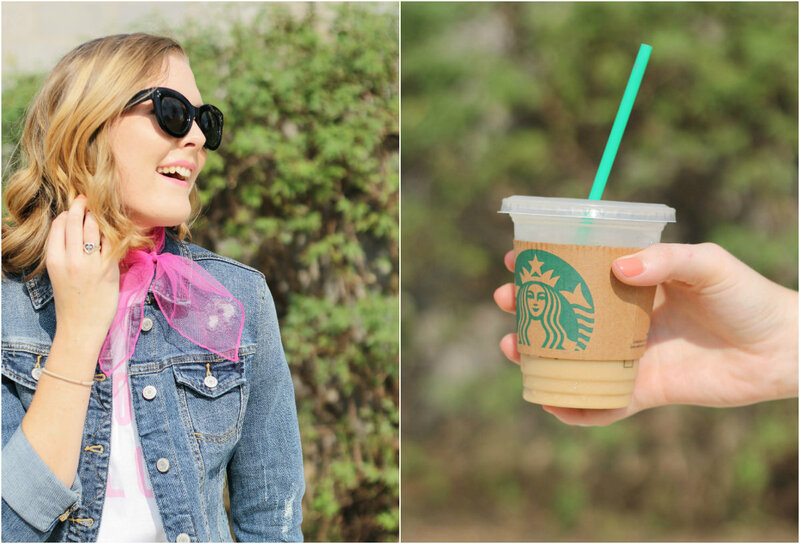 And yes to clothes being able to "talk for you"! 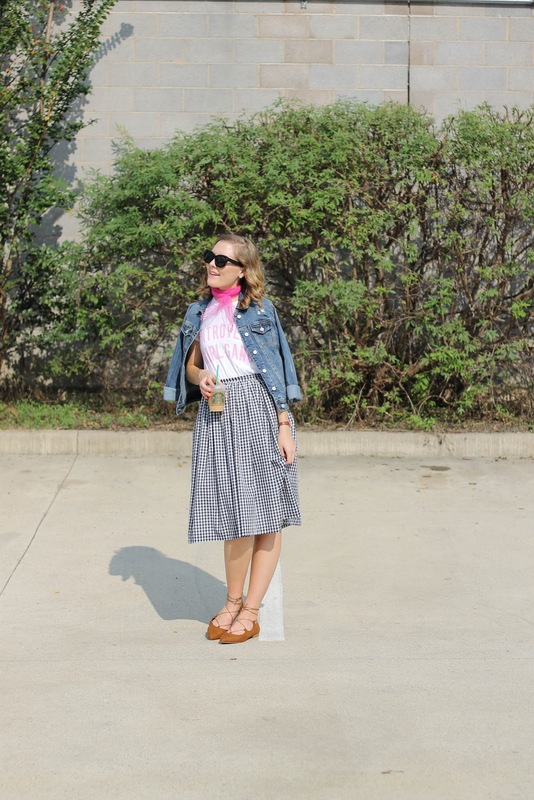 I've learned to incorporate more skirts and vintage-y kind of clothing items into my wardrobe (e.g. things I never would have dreamed of wearing a year or two ago :P) and it's great fun. 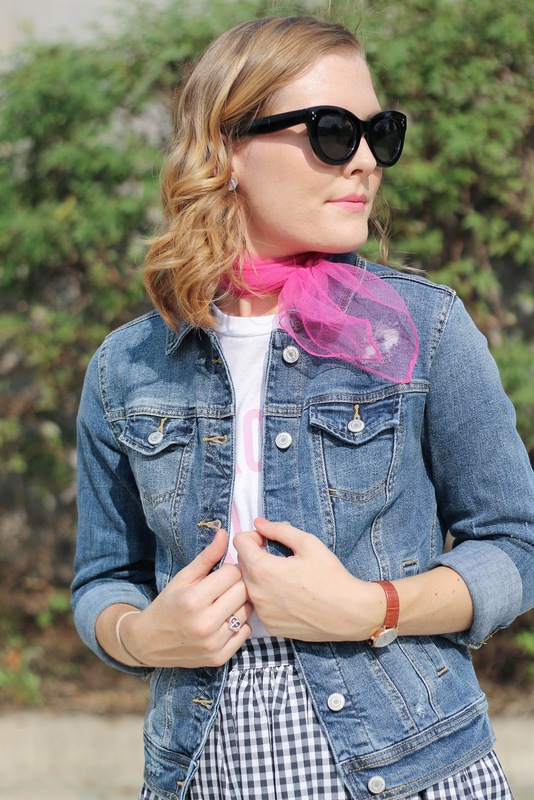 Wearing an outfit you love is definitely a confidence booster, and it's so refreshing to remember I don't have to dress like everyone else or feel odd for not doing so. I am still working on defining my style. 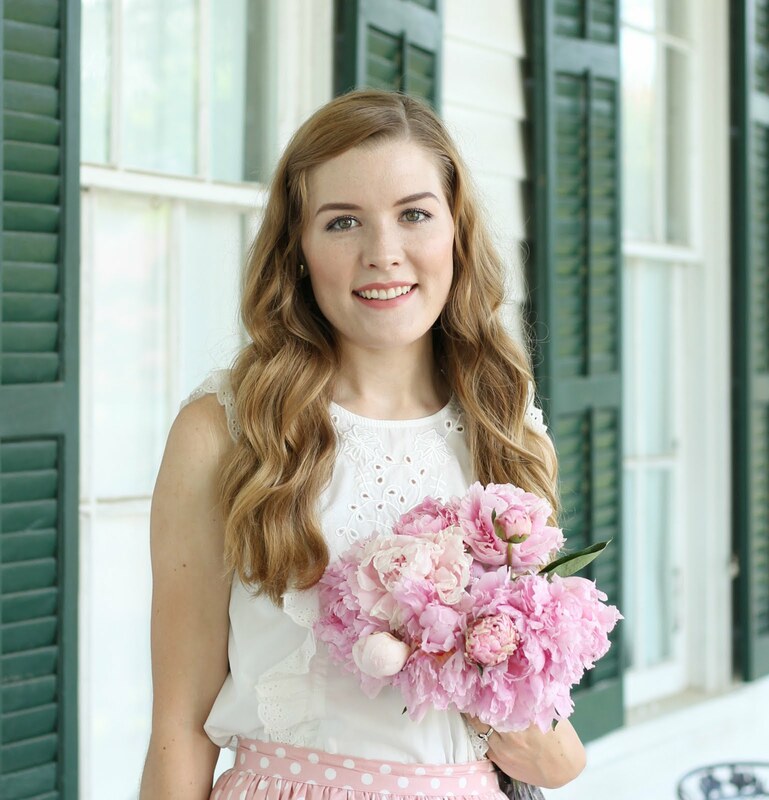 I realize that how you dress can affect how people think of you, and as an introvert first words are likely going to be few, so whatever you can do to otherwise make a good impression, such as clothes and facial expression, will help. Oh my gosh, Madison! You are so right. 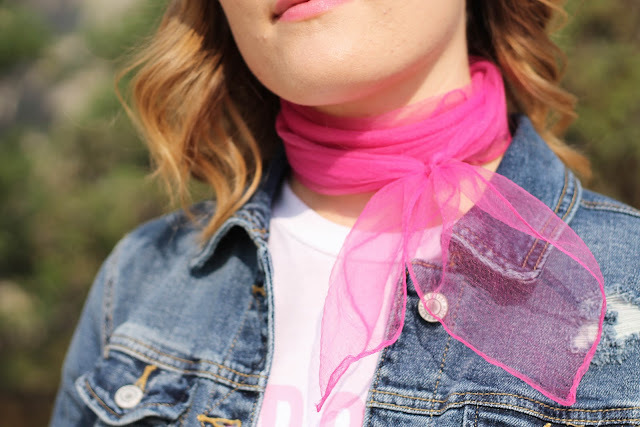 I can relate to everything you just said... and definitely clothes are super important, sometimes I even worry, "What if what I'm wearing does't give an accurate impression of who I am?" But that's kind of silly I guess because first impressions are wrong 95% of the time, haha. Introverts unite! Love that we are in the same page Sarah!